I know, I know. Strictly speaking this isn’t a Halloween graphic but it is still one of my favorites. Whether your Halloween is cute and sparkly or oh-so spoooky, have a safe celebration and come back next week primed and ready to write something new. Technically there is no single right way to cite your sources. The whole purpose of citations is to enable your editor, or your reader, to find these same materials. That said, various editors and publishers each have their favorite style. The most common are APA (American Psychological Association), The Chicago Manual of Style, and MLA (Modern Language Association). The staff at Red Line Editorial wants everything in MLA (Modern Language Association) format. Fortunately, if your editor or publisher wants any of these three styles, you can find the information on how to cite in this style at the Purdue Online Writing Lab or OWL. OWL is an amazing source of information on writing, academic writing, punctuation, writing assignments, how to conduct research and how to site your sources. Whenever I want to cite something that isn’t explained in one of the many examples, I simply gather all of the information that someone would need to find that museum exhibit or display and format it in the style of the other citations. Hope this helps you find the information that you need to cite the sources you are using for your current project. I know a lot of people who have published with either Enslow or Rosen so this caught my eye. Last week, Roger Rosen announced that Rosen has acquired Enslow. Rosen said that Enslow will continue to publish the types of books that have earned it a solid reputation. Subjects include biography, contemporary topics, health, history, civics, holidays, math, science and sports. Enslow will continue producing these books as an independent house with dedicated editors. Hopefully these expanded offerings will open up additional opportunities for writers. See the complete story at School Library Journal. 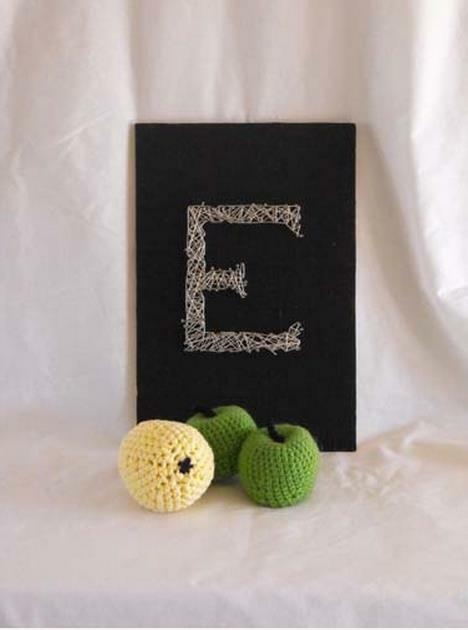 The crocheted fruit has nothing to do with the string art but the display more interesting. A close up and an interesting angle. One of the most difficult aspects of craft and activity writing is getting a descent photo. I don’t mean the step by step photos. Those are actually pretty simple because the entire focus is the craft item. When I submit crafts and activities to Education.com, I have to include a photo that illustrates . . . whatever. Sometimes it’s a craft like this string art initial. 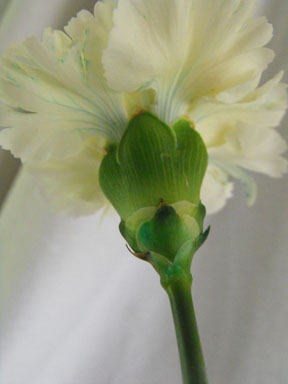 Sometimes it’s an activity like dying a carnation. What makes these pieces difficult is that this is for an online market. When I take photos, I need to think Pinable. Yep, everything I send them needs to be Pinterest worthy. Fortunately, for me anyway, it feels like a game. What can I do to make this photo attractive an interesting? In short, how can I stage it? Sometimes I simply include other related items such as Halloween decorations for a Halloween craft. For a writing or drawing activity, I might include pencils and pens or markers and crayons. I also play around with angles, shooting up and down at things, or lighting that creates shadows. One of the basic rules that my editor gave me is to use a white background. A writing activity on white paper disappears into a white background. That’s when I pull out a tablecloth, blanket or placemat. I’ve also had to learn to stage food — placing grain products (ho hum tan) in colorful dishes, adding a dash of cinnamon or some colorful fruilt. I’m not going to claim that I’m always successful. In the middle of one food related shoot, one of the cats decided to sample and I photographed her paw. I’ve also discovered dust, hair and other bits of ick clinging to whatever. If you need to stage photos, gather a variety of backgrounds and props. Experiment with set ups but remember what the focal point of your picture needs to be. Once you have a set up you like, play with angle, lighting and distance. Close ups often make more interesting photos that shots taken at a distance. You aren’t going to get every photo in one shot but it is a lot of fun playing until you get it right. Just don’t leave the recipe unguarded while you photo edit. Cats are opportunists. My students are busy working on their nonfiction assignments but they’ve also asked me to define various types of short nonfiction. Here are some of the things that you can work on for the various magazines, ezines and web sites out there. This piece of string art is one of the craft activities that I’ve done for Education.com. An article is a piece of nonfiction in a larger work such as a newsletter, magazine or ezine. This is a fairly broad category and can cover science, history, current events and much more. Leslie Wyatt’s “Horse Talk” in Highlights (November 2014) is an article about how horses communicate with their ears, tails and vocalizations. A profile is an article that focuses on a specific person. Most often when you hear the term profile used it is about a person who is still living. If you were to write a piece on Lincoln, you would call it an article, unless of course it is reader’s theater. Stacy Nyikos “Balancing Rocks” in Highlights (November 2014) is a profile of the German artist Sepp Boggle (the o should have the double dot dialect mark over it). In addition to other research, many profiles are based at least in part on interviews. Question and Answer is an article based on an interview. It has a very specific format in that the writers asks a question (this paragraph is labeled Sue or Question) and then the interviewee responds (with this paragraph labeled Interviewees name or Answer). Reader’s theater is a play to be read in the classroom. My piece that is being reprinted by Schoolwide is reader’s theater. You use narrators and dialogue to tell the story of an event. I wrote about Gertrude Ederle, the first woman to successfully swim the English Channel. A how-to gives the instructions that the reader needs to do a particular task. The pieces that I do for Education.com are how-tos. I start with a brief explanation and a materials list before going into the numbered steps. A craft is a how-to that guides the reader in making something like a wall hanging or a bracelet. An activity is a how-to that shows them how to do something activie like play a game or perform a simple science experiment. Recipes are activities that involve cooking. There is cross over between this category and activities in that you can have a math activity that involves food. Can you think of any other types of short nonfiction? Although I still write two book reviews a week for my own blog, Bookshelf: What We’re Reading, I very seldom review professionally any more. For those of you who don’t know, for 11 years I reviewed books for the St. Louis Post-Dispatch. It was a great gig because I essentially got paid to read and write. Add a good cup of coffee and what more could a girl want? The best part of it is that I learned a lot about what it takes to write a good book. I learned to look for strong characters, logical motivations and a plot not only flows but makes sense. I learned to read for voice — true voice. Let’s just say that I can pick out a New York-style Southern drawl from a fer piece. I learned the importance of a strong setting that is integral to the story. I learned about book design and why paper color and texture matter as do font and ink color. I came to understand how important it is for the cover to be a good fit for what is inside the story. I also saw the difference in book design between the big houses and self-published books. I know it annoys a lot of people, but 90% of the time I can pick out a self published book without ever cracking the cover. Once I open the book, I know for certain. Reading stacks and stacks of books, I also sympathized with the editor reading slush. Unless it is a something for book club, I will not stick with a book that hasn’t hooked me by page 15 and that’s if I’m feeling especially generous. You may not be able to get a gig as a book reviewer, but I challenge you to educate yourself. Read 100 books in your category (picture book, early reader, middle grade) before you submit your work to an editor or an agent. Planning to self publish? Then read 200. If your manuscript isn’t as good as what you’re reading, you’ve got some work to do before you put it out there. This is, after all, your competition and your book needs to be able to stand out, for good reasons, in a crowd. I write on a variety of topics for multiple audiences. What do I mean by this? Crafts and activities are one of my mainstays but I don’t write them all for the same audience. The pieces in Gryphon House anthologies were written for preschool teachers. Those on Education.com are for parents who may also use these activities with scouting groups and the like. Sometimes I write things up for the kids themselves. Whenever I write up a craft or activity, it is vital to know who my audience is because this introduces suble differences in how I handle the topic. When I write for preschool teachers, I emphasize flexibility. The piece is good for a group in that they can do much of it themselves, the supplies are inexpensive and can be prepped ahead and it is easy to clean up. If it is an activity or pretend play, it is flexible in allowing a larger or smaller number of children to participate. When I write for the parents who read Education.com, I emphasize the educational aspects of the activity. It will hook your child with FUN and they will learn something too. Crafts need to be educational and it is definitely a bonus if they are attractive and can be displayed in the home. Kids, on the other hand, want something that is fun. They want to show the adults what they can do. If you can make them feel daring, so much the better. Now think about your current project. 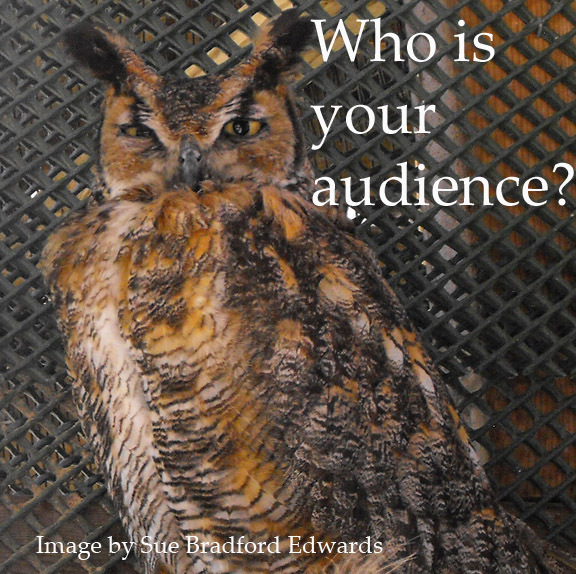 Who is the audience? How does knowing this influence your approach or your message? How would that approach or message change with a different audience? I have to admit, I have attempted NaNoWriMo only once. For those of you who have somehow missed the phenomenon that is NaNoWriMo, it stands for National Novel Writing Month. During the month of November, each participant commits to drafting a 50,000 word novel. No, you can’t rewrite something you’ve already written. No, this isn’t the time to finish up something you’ve started. When you sign up, you are committing to draft at least 50,000 words of a NEW novel. If you’re a children’s writer, this looks like a lofty goal. Yes, many young adult novels are this long but a lot of what we write is much shorter. The nonfiction books I write for Red Line Editorial are 14,500 words, less than half this length. In fact, the longest single manuscript I have in my files is 35,000 words. Maybe that’s why when I did give it a whirl I didn’t commit as seriously as I might have. A lot of my friends do it so I commited to give it a try. Yep. That’s a ringing endorsement and sounds like something a teen character might say. “Well, my friends were all doing it officer.” Ah, well. Dip that I am, a few years ago I decided to give it a shot. I’d love to say that I did wonderfully and finished a full draft, but it isn’t true. I fizzled out about half way through the month. Part of the problem was that I have never done anything long enough fast enough to make me believe it is possible. Yeah, I was giving it a try but I wasn’t entirely sold on the idea. When things got tough, it wasn’t all that hard to derail me. In addition to not commiting emotionally, I was also coming off several major deadlines. I got everything done that was due in October and another deadline for November. By November 1, I had the month clear to work on my project. But I hadn’t done any prep work. I don’t do a lot of outlining with fiction so this didn’t worry me, but it also meant that I didn’t really have a plan. Now, that I’m working on my second book for Red Line, I know better. I will get this book done in 8 weeks. 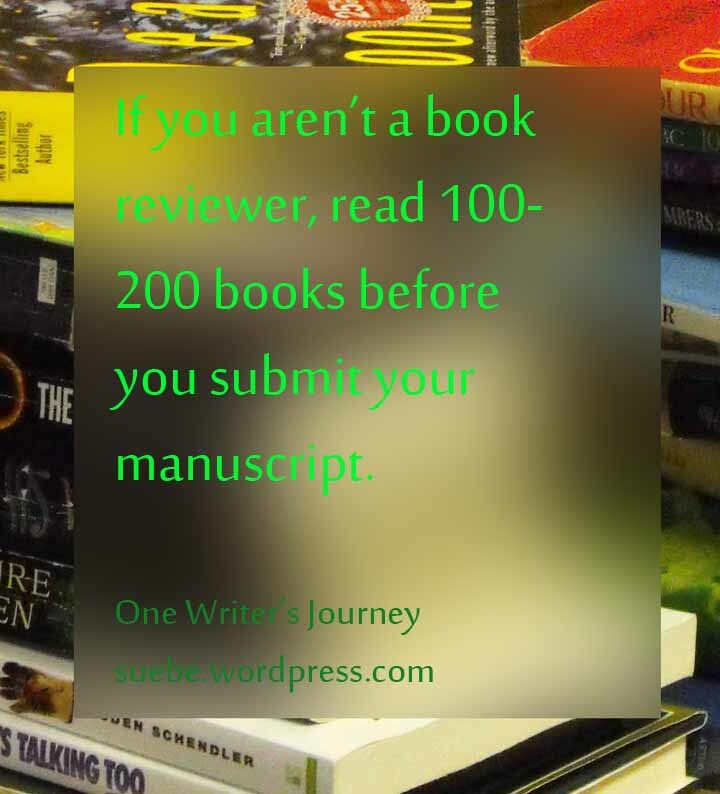 That includes research, outlining, writing and two or three rewrites. Yes, it’s only 14,500 words but this is finished copy. NaNoWriMo is a rough draft. I can take this project from start to finish because, before I fall into writing, I do my prepwork. I know what I’m writing about. I’ve got a plan. I can write and write hard because I know where I’m going. I finish a full draft in less than two weeks. That,in my opinion, is the key to a successful NaNoWriMo. For more on what this writing plan entails, see my post for tomorrow at the Muffin. Recently, a friend of mine wrote a horror short story. Did I want to read it? My son is on a serious zombie kick. In the name of mother and son bonding, I have suffered through an entire season of the Walking Dead. Never mind that I love Zombieland. Horror freaks me out. I may agree to watch it with you but someone will have to hold my hand and it will not be a pain free experience. Did I want to read her story at home by myself on a perfectly sunny day? Wait? Isn’t that when the walkers come? I hemmed and hawed my way into an embarrassing pause. This friend doesn’t particularly enjoy tormenting so I recovered enough to agree and soon found myself immersed in a non-gross horror story. It was amazing. Afterwards, we discussed the difference between old-style atmospheric horror and new-style gooey, pustulent horror. In the old type of horror it is all about atmosphere. 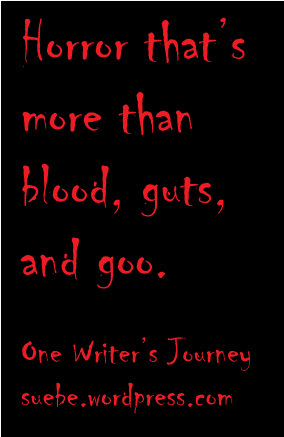 How can you set your story up so that the reader is more than a little uncomfortable and expecting something that goes bump, glop or yuck in the night? They expect it, but the details you provide aren’t necessarily graphic. This is the gross and disgusting viewed through slightly parted fingers. Think Poe. His stories are wharped and weird and offputting, but they aren’t particularly repulsive. You build the horror by choosing creepy details ranging from the fall of light to the creak of a floor board or the closing of the door. You include details that can be described in a creepy way. Lace might be web-like, wind groans, and a cellar smells like the freshly turned earth of the grave. Okay, that’s most likely heavy handed but I hope you get the point. You can write horror without the ick. Who is your favorite writer of bump in the night, creepy horror? Whether you are writing fiction or nonfiction, both require research. The problem is that if you aren’t doing two types of research your writing may be in trouble. You need to do both the research required to write the piece and research on the competition. I’ll explain this using some of my recent work as an example. As I’ve mentioned several times recently, I’m writing about Pearl Harbor. Obviously, this means that I’m gathering lots and lots of information on Pearl Harbor. But I also need to have an eye for my competition. What is already out there? What exactly did they cover? What did these books do well and, perhaps more importantly, not so well? 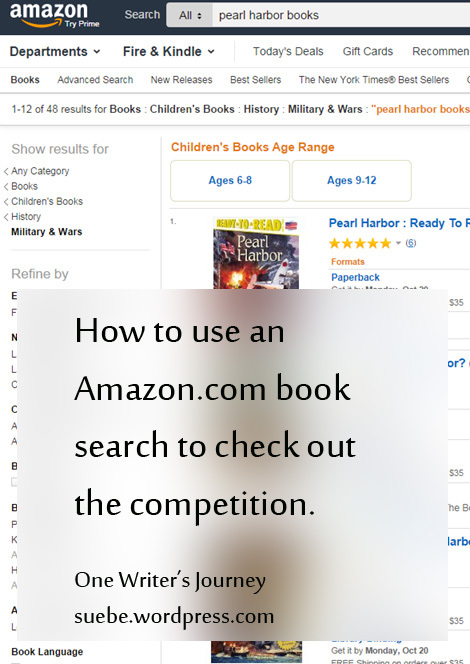 When I’m researching the competition, I always start with an Amazon search. In this case, I would do a book search on “Pearl Harbor.” Maybe you’re more industrious than I am but that search yields 4,923 titles. I don’t want to pick through all of them to see what the competition is up to so I need to narrow it. When your search results come up, you’ll see a column of categories to the left. Under BOOKS> there is “see all 23 departments.” Click that. When I did this for my Pearl Harbor book search, it gave me three children’s books choices — Military Books, 1900s American Historic Fiction, and American History of 1900s. I would look at first Military Books with 48 books and then American History of 1900s with 35 books. There is probably overlap in these two categories but going through 83 books total is a lot easier than going through 4,923. For whatever reason, your category choices aren’t always the same when you do an Amazon book search. 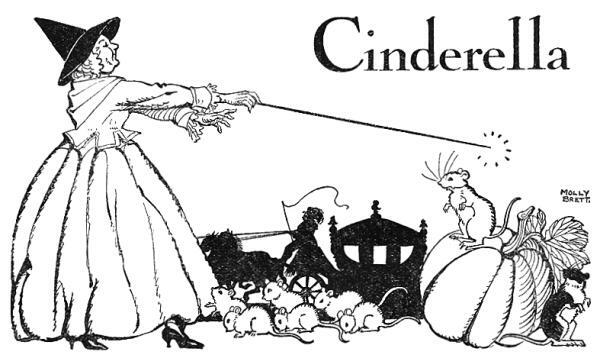 When I did a search on World War I and then click to see all departments, I get one choice for Children’s Books. I’m not sure why it varies from topic to topic but there you have it. If you aren’t taking the time to research your competition, you may be writing a book almost identical to one already on the market. Avoid this by doing some research and making your book 100% unique.